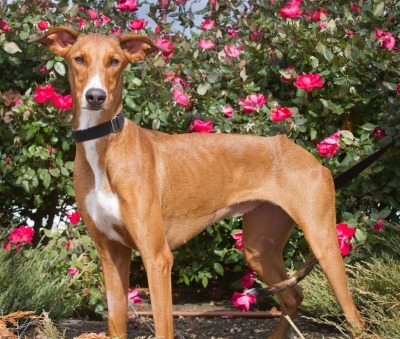 Phoebe is a an approximately 1-year-old red female sighthound mix who came to GALT via Collin County Animal Services, where she arrived as an owner surrender with Prue, who is her littermate. Phoebe spent some time with trainer Mary Waugh Swindell, who gave us this training evaluation. Phoebe has presently tested intolerant of cats. 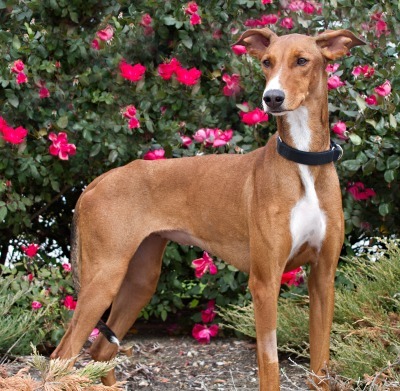 Sweet Phoebe is a beautiful and fun loving young girl. We recently had a swab DNA test to determine her background – she is half Doberman, quarter Ibizan Hound and quarter mix! 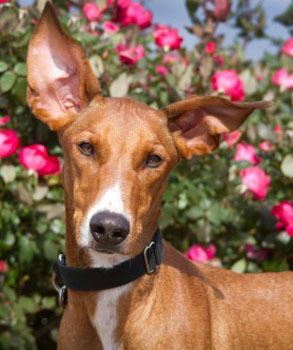 Her coat and stance are Doberman, while her ears and jumping ability are Ibizan Hound; her prey drive comes from her entire lineage. She should not be in a home with cats or very small dogs. Phoebe enjoys energetic play with her 40 lb non-greyhound house-sister. Phoebe is a huntress, always on the lookout for the next squirrel invasion. We are working with her to tone down her prey drive by limiting her view of the outside and providing food puzzles to keep her occupied. She constantly reminds us to put things away – table and counter surfing are habits we are still trying to break. Phoebe is an opportunist and willingly gives up her find for praise or a treat. She is a brilliant, food motivated pup who is very trainable with the right family. Phoebe is a morning dog – full of love and enthusiasm when the sun comes up, plays all out for a while and sleeps quite a bit during the day. Late afternoon she is ready to play, eat, play and nap. When the sun goes down, Phoebe can be found on a dog bed quietly snoozing until it's time to go in the crate for the night. She is house trained and does not get on the furniture. The ideal family will have a suitable canine playmate that loves to play and run around in a yard with at least a 6 ft fence. She adores children but she is very strong and could accidentally knock over a small child. Phoebe must be crated when her family is away. She wants to please and is very trainable; we feel agility training would be a terrific outlet for her abundant energy and focus.